Phil (a.k.a. Morpheus71, from his graffiti art days) is an emerging and multi-award winning landscape photographer in Totnes, South Devon, UK. 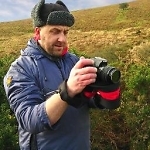 Phil was invited to be a member of the National Trust's Photography Team in the summer of 2015 and has been out photographing properties and been involved in the photography for their recent coastal walking campaign in Southwest England. Phil is incredibly lucky to live between stunning beaches and fantastic moorland – he loves walking in the moors, climbing the cliffs and catching waves. He is passionate about using visual imagery to capture the emotions, atmosphere and action of his subjects. His highly detailed and often visceral work reflects his passion for rich light, colour and contrasting textures.